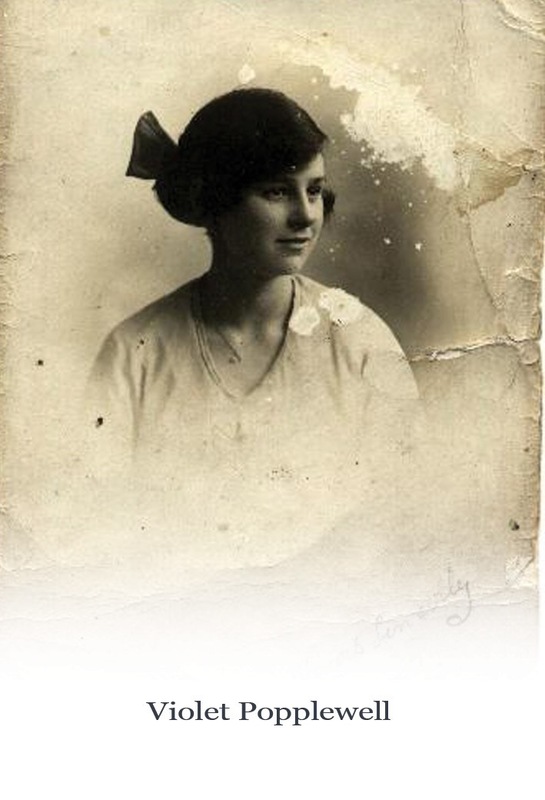 My Nana, Violet Popplewell was born at the beginning of the twentieth century on the 12th December 1900 in the small industrial town of Batley, West Yorkshire. Her father Harry Popplewell had worked in the coal mines since being a young boy and at the young age of 25 died of silicosis, a disease of the lungs common to miners. Violet was only two years old when her father died so didn't have any memories of him, her mother Rose Tozer remarried when Violet was four to William Whiting, a widower and father of five daughters, so Violet went from being an only child to having 5 stepsisters. William lived in the small sea side town of Bridlington on the north east coast of Yorkshire, he worked by the railway but he also had a small bed and breakfast, which Rose helped to run. One of the step sisters was about the same age as Violet, they called her Joey though her real name was Fanny, and she was born on 1 April 1899.Violet had a great friendship with Joey and most of Violet's stories were about the adventures that she and Joey had together. One story was from when they were still young, it was Easter and Rose, Violet's mum had sewn for all the girls new Easter dresses, white with red ribbons. Their outfits were made complete with Easter bonnets decorated with flowers. After church the girls asked their parents whether they could go down to the sea front, only if they promised to stay on the promenade and not go onto the beach. For the young girls the temptation was to much and one of them suggested going down the steps to the sand and walking along the sand until the following steps a little bit further, what harm could be in that? The following steps where further than they had thought and as the tide was coming in the girls ended up getting wet, their new Easter dresses were ruined because the red colouring of the ribbons had run onto the white dresses. As you can imagine their parents weren't very pleased. On one occasion Violet and Joey went out with a rowing boat, it was a beautiful day and the girls sat in their boat enjoying the sunshine and reading their books. They were so engrossed in their books that they didn't realize that their little boat had drifted all the way out to sea, they had to be rescued by the life boat. When the girls were a bit older they had bicycles and would often go biking in the surrounding countryside. On one occasion they were with a friend who had just received a brand new bike, Joey was a little bit jealous and asked whether they could swap bikes for the day, the friend was a bit reluctant but eventually gave in to Joey's persuasion. What Joey didn't realize was that her friend's bike didn't have hand brakes but had back pedal brakes instead, needless to say it didn't go very well with Joey biking down one of the steep hills in the neighbourhood. It was a busy life for my great grandmother Rose with a large family, she had three more children to William, and running a bed and breakfast as well but my nana told me that when the guests departed the girls would make sure that they were stood out front because they were often given some money or sweets by the guests. Even though Rose and William eventually divorced and Rose and Violet and her youngest child Hector moved to Hull, Violet always stayed in contact with her step sisters, especially Joey.